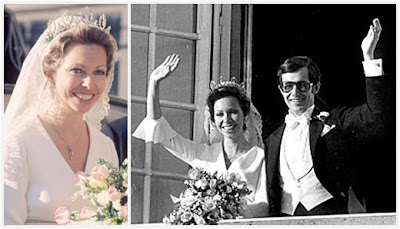 We're picking up where we left off last week, with the weddings of the last of King Carl XVI Gustaf's four sisters, the Haga Princesses. Princess Margaretha was the oldest of the four Haga princesses, but the third to marry - though according to reports, she had an earlier opportunity that wasn't destined to be. Her romance with Scottish aristocrat, pianist, and writer Robin Douglas-Home gathered plenty of press, but a reported proposal was shot down by Margaretha's family, chief among them her mother Princess Sibylla and her grandfather, King Gustaf VI Adolf. Douglas-Home said the Bernadottes looked down on his non-royal blood, though other perspectives dispute that (a book written by the princess' nanny said the proposal wasn't accepted because Margaretha didn't want to marry him). And indeed, when she did marry, it was to another British man, this time without the aristocratic connection. Margaretha married businessman John Ambler at the end of June 1964, following her sister Princess Désirée's wedding at the beginning of that same month. 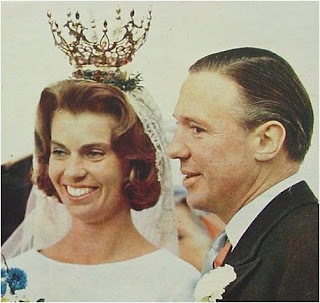 In contrast to Désirée's royal wedding at Stockholm's grand cathedral, Margaretha's wedding was small by design, a quaint (by royal standards) Swedish summer wedding held at the Gärdslösa church on the island of Öland. She did not continue her sisters' tradition of wearing the same wedding gown by Märtaskolan, but the couture shop and school plays a roll in her wedding dress as well - Margaretha actually studied dressmaking at the school. She opted for an even simpler silk design, with a straight silhouette, short train, and long sleeves. The simple dress was practically a requirement, given her chosen accessories. Like Désirée, she wore the lace family wedding veil from Queen Sofia, but instead of a family tiara, she wore the bridal crown belonging to the church she married in, perched atop a myrtle wreath. Bridal crowns are traditional, and occur in various forms in different cultures, but the height and size of this crown makes quite the statement. As with all of her sisters except Princess Birgitta, Princess Margaretha lost her "royal highness" styling following her marriage to a commoner, and is known as Princess Margaretha, Mrs. Ambler. The couple made their home in Britain and had three children; they remained married but were separated for a time at the end, and John Ambler passed away in 2008. Margaretha did have occasional involvement in royal engagements, but we tend to see her mainly at large royal family events. Ten years passed before the wedding of the last and youngest Haga sister. 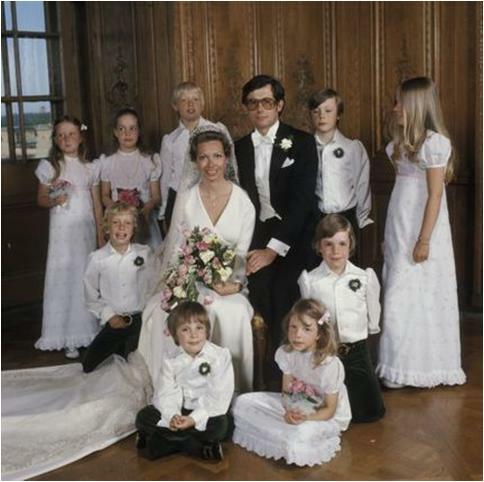 Much had changed since the weddings of Princess Christina's older sisters; their mother, Princess Sibylla, passed away in 1972, and their grandfather, King Gustaf Adolf, passed away in 1973, leaving their little brother as king. Princess Christina married Tord Magnuson in the Royal Chapel at the Royal Palace in Stockholm (the same location where we'll see her goddaughter Princess Madeleine marry soon). As with her sisters, she wore a gown from Märtaskolan, but hers was the last of its sort to be made there, and it closed not long after. The white silk crepe gown seems easy to date to 1974, with its wrap-style top and v-neck, bell sleeves, and bands accenting the waist and the slim skirt. The gown also included an attached train. She too wore Queen Sofia's lace veil, but varied from all her sisters in her choice of headgear: she wore the Connaught Tiara. The tiara was one of Princess Sibylla's favorites (so much so that it has been referred to as "Princess Sibylla's tiara"), so its selection could be seen as a tribute, due to her relatively recent passing. Christina pitched in as first lady to her brother, King Carl Gustaf, in his first years as an unmarried king, and she stuck around. She takes on the largest royal role out of the Haga princesses today, and we do see her at events like the Nobel Prize Awards; she is known as Princess Christina, Mrs. Magnuson. The couple have three children. Which of the Haga Princess gowns is your favorite?